Police Seek Another Suspect Connected to Vehicle Burglaries. Previously Wanted Burglary Suspect Has Been Arrested. South Brunswick Police have issued a warrant for the arrest of 19 year old Antoine McDonald in connection to a recent car burglary. McDonald has been charged with breaking into a car in the Summerfield Development on September 1st. Surveillance cameras in the area show McDonald and an accomplice entering an unlocked car and rummaging through the center console. Police have information that McDonald may have left New Jersey and are requesting the publics assistance in locating him (see the attached picture of Antoine McDonald). McDonald is the latest person identified in a rash of unlocked car burglaries in the Township. 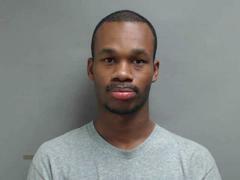 Last week, 26 year old Alexander Allen was arrested in connection to a recent attempted car burglary on Deans Lane on September 3rd. Allen was identified in that incident when his fingerprint was recovered from the burglarized vehicle. Police ask anyone with information on McDonald’s whereabouts to contact South Brunswick Police at (732) 329-4646.